Sometimes, it’s almost eerie how things happen in the hockey world. The Windsor Spitfires came back from a 5-0 loss on Thursday night with a 5-0 win of their own as they defeated the Erie Otters Saturday night at the WFCU Centre. Right from the start, it was noticeable that the Spitfires had refreshed fuel in their tanks. Seconds in, Zack Macqueen skated into his opponent’s zone for an early chance that was turned aside. Later on, at the other end of the ice, Spits goalie Jaroslav Pavelka stood tall as Erie broke out on a 3-on-1. It was even play for most of the period, but as time kept ticking, the Spits found themselves in a familiar place: the penalty box. Fortunately, they had a strong defence that stopped the Otters on every occasion. The game began to get physical, and following John Bowen’s solid fight against Johnny McGuire, the two teams headed to the intermission with no score. The Erie Otters came out in the second looking to make a statement, a physical one. They would deliver several big hits on the Spits, but that did not slow down the home town boys. As a result of the quick play, Zack MacQueen was tripped at the blue line, trying to split the defence. Shortly after, the Otters took another penalty, and the Spits now had a 5-on-3. And they did not let this opportunity slip from their hands. MacQueen was rewarded for his efforts after he tipped in Rychel’s shot past Erie goalie Ramis Sadikov. A minute later, Brady Vail received a pass from former otter Chris Marchese, and his shot would put the Spits up 2-0. The Spits weren’t done their scoring in the second period just yet. Rychel passed the puck across the crease, and after MacQueen’s missed opportunity, Kerby finished the play with a backhand goal. Things were starting to settle down for the Spits as they went into the locker room with a commanding 3-0 lead after 40 minutes. The Spits didn’t let their engines cool going into the third. Chris Marchese made a big block on an Otter defenseman’s slap shot. He kept playing hard, skating harder and scored a goal against his ex-club with Ben Johnson getting the assist. Marchese would return the favour just over ten minutes later, and Windsor’s power line hit hard again. After his shot went wide following a pass from Vail, Marchese found Johnson alone in front and there was no mistake. Stephen Alonge finished the night with a fight with 33 seconds to go, and that wrapped it up. 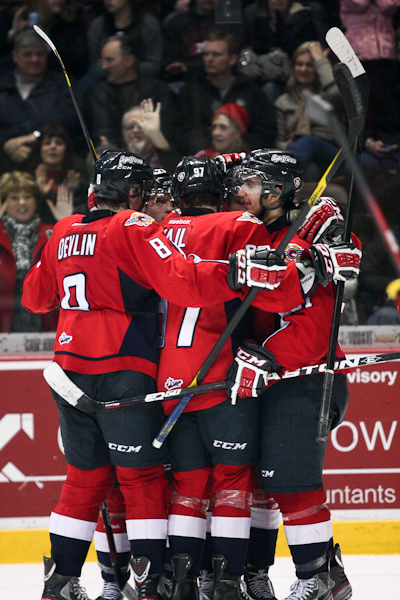 The Spits dominated the game, and went on to defeat the Erie Otters in front of 5890 cheering fans. Marchese, in his first game back after serving his two-game suspension, received 1st star, Pavelka with his shutout received 2nd star, and Johnson, with a goal and an assist, received third. The Windsor Spitfires’ next home game is Thursday, February 16th at 7:05pm against the Plymouth Whalers.